The National September 11 Memorial & Museum has opened in the footprints of the World Trade Center in Lower Manhattan. Electrosonic provided the audio-visual systems for the museum, which is primarily located about 70-feet (21-meters) below ground and offers a unique visitor experience. The National September 11 Memorial & Museum is an educational and historical institution honoring victims of both the 9/11 terrorist attacks and the 1993 bombing, while examining 9/11 and its continued global significance. The museum building was designed by Davis Brody Bond, LLP with exhibit designs by Thinc Design and Layman Design. It is accessed by an entry pavilion designed by Snøhetta. The main exhibition space, reached by a gently sloping ramp, includes remnants of the Vesey Street stairs, the Twin Towers’ structural columns, a portion of the original foundations plus a permanent collection of artifacts. 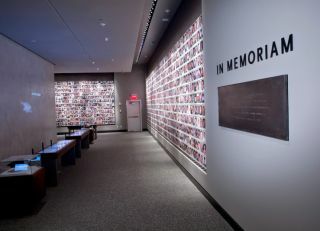 The memorial exhibition features the Wall of Faces, which displays photo portraits of the nearly 3,000 victims of the attacks, and interactive tables to learn more about them. The historical exhibition uses artifacts, photographs, and media to recount the events of September 11, explore the background leading up to these events, and examine their aftermath and continuing implications. The vast Foundation Hall houses the exposed side of the slurry wall, the surviving retaining wall of the World Trade Center, and the well-known Last Column, a 36-foot high column covered with mementos from Ground Zero. Bob Haroutunian of PPI Consulting was the audio-visual systems designer for the museum and education center. Arup was the designer for the Pavilion Auditorium. The majority of the content was provided by Local Projects, with additional content provided by Infusion and Project Rebirth. “This was a very large museum project located several stories underground, which made it a bit of a logistical challenge,” says Electrosonic project manager Jackson Benedict. “The site is spread out over nearly eight acres, so just getting from one side to the other took a long time.” The project spanned several years so Electrosonic had to stay on top of evolving technology and equipment advances as equipment was specified and installed. Electrosonic created full-scale mock ups of about 70 percent of the exhibits at some point in time. “We did a lot of testing with Design & Production near Washington, D.C., Hadley Exhibits in Buffalo and our own facility in Burbank,” adds Electrosonic account executive Bryan Abelowitz. Electrosonic supplied a traditional museum system for the exhibition space where approximately 100 media experiences are available for visitors. These range from touch screen interactives, small theaters and displays playing media to recording booths that enable visitors to record their own 9/11 stories. Several exhibits required especially complex media systems. The first exhibition visitors see as they enter the galleries is We Remember, which features recollections of people around the world as September 11, 2001, dawned. Six large, vertical screens are staggered down a 60-foot ramp; a portion of a world map is projected on each of the six screens, such that, at the top of the ramp it appears to be one cohesive map. Digital Projection projectors with mirror mounts display the content, while 16 ceiling-mounted Atlas speakers recount, in multiple languages, where people were on that fateful day. Rebirth is based on timelapse documentary footage captured by filmmaker Jim Whitaker over the last 13 years on the site, from the clean-up of the pit to today’s rebuild. Seven Sharp projectors display the approximately 11-minute video on three walls that surround visitors. A full EAW sound system delivers the audio. “We built a full-scale replica of the room in our Burbank facility and tested a variety of content in it,” Benedict reports. Since the Last Column, a 36-foot steel piece from the Twin Towers, is so tall, two 55-inch ELO touch screens run Local Projects’ interactive software, allowing visitors to scroll up and down its full length to see high-resolution details of the signatures and mementoes on its sides. Eight interactive tables in the memorial exhibition enable visitors to scroll through the Wall of Faces or search for loved ones and access biographies and family photos. 3M supplied the touch screens, Dell the computers and Local Projects the software to operate this especially impactful exhibit. Electrosonic also provided a full AV system for the multi-purpose Pavilion auditorium, an approximately 150-seat theater used to show videos throughout the day and available for hosting events from standard presentations to video conferences. The museum has four education classrooms equipped by Electrosonic with digital whiteboards, document cameras, video conferencing systems plus other standard features. Key equipment components in the museum include Sharp, Christie and Digital Projection projectors, Alcorn McBride audio playback, Vista Group SoundStik audio stations, Dataton WATCHOUT display and playback, Adtec signage players, Boland, Sharp and Samsung LCD displays, Extron extenders and Medialon system control. Three control rooms service different areas of the museum with a total of 26 equipment racks in use. Signals are extended via a mix of fiber optic and twisted pair extenders. “The fiber and copper backbone we used allows the museum to expand with higher-resolution video or new monitors and projectors as they become available,” notes Benedict. The Pavilion auditorium has its own control room with two racks. Each education classroom is self-contained.